As my clients begin to get Windows Vista on new computers, I needed a new machine to assist them with the questions they will almost certainly have. 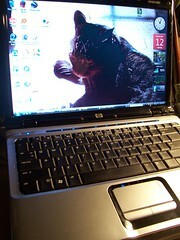 This is an HP Pavilion DV200 with 2 GB of RAM, 160GB HD and AMD Turion Dual Core Processor. So far, I am liking it a lot. Very perky. I got the 15" version, as I plan on carrying this around a lot more than my previous laptop, as I am doing more speaking engagements on podcasting and other topics.